Fancher Creek Roundabout – Yamabe & Horn Engineering, Inc. The Fancher Creek development in southeast Fresno is a significant commercial project aimed at dramatically improving retail resources in the mature area. Working with the developer, Facher Creek Properties, Yamabe & Horn was involved in developing the sitemap, utilities, service infrastructure and flood relief design. They were also involved in developing super-pads for future development before additional roads were constructed. Of all the components developed, the most unique feature Yamabe & Horn was involved in creating was the roundabout on Armstrong Avenue at the east end of the project. Given the unique shape of the southeast corner of the parcel, maximizing the number of pads in usable sizes was a challenge. Since there is established residential to the west and south and Armstrong Avenue currently ends inside the development, creating an access road that could handle delivery truck traffic was important to making the pads at the end of the street as viable as possible. Since the site plan is focused on a Build-To-Suit approach to attracting new retailers, it is unknown as to when the back pads will be built out. To accommodate any service traffic to them, a roundabout was installed to allow vehicles to exit easily before being stuck at the end of the street. It also allowed for a median to be placed along the length of Armstrong Avenue, preventing future retail traffic from stopping flow by simply turning across the oncoming lane at any point. To provide the property owners with a traffic system that would meet future standards given the long timeline for completing the property, Yamabe & Horn designed the roundabout to the 1st Edition of the Federal Highway Administration guidelines. 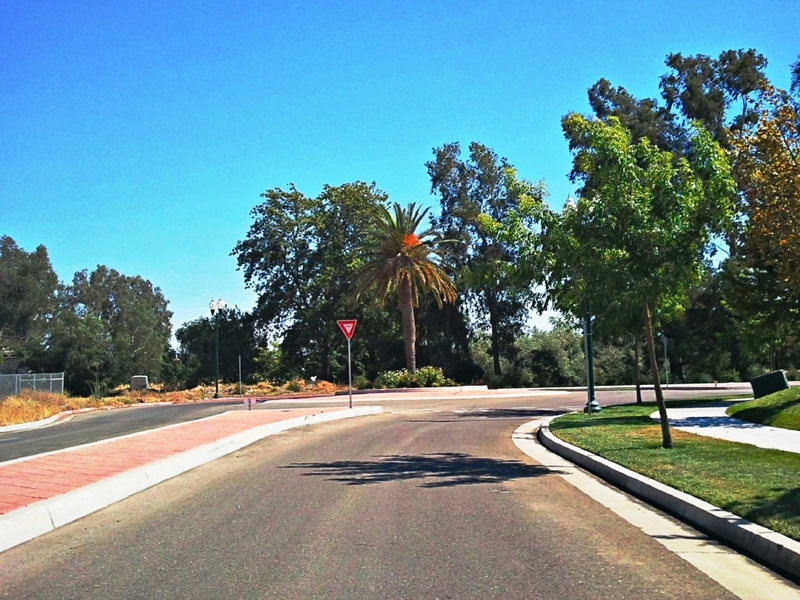 This provided a modern roundabout, as opposed to a simple traffic circle, and increased the likelihood that the road will easily fall within City of Fresno standards well into the future. The roundabout is 95 feet in diameter and provides enough turning radius for the most common vehicles on the road today.